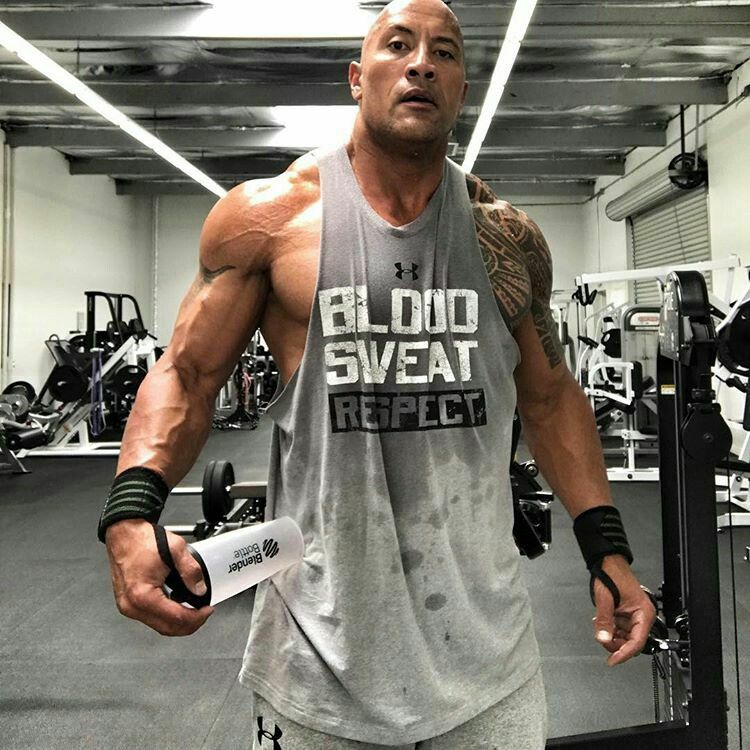 One of the most impressive features of Dwayne ‘The Rock’ Johnson’s physique, is his massive upper body, or to be more specific – his shoulders and arms. To achieve and maintain such a massive and intimidating form, Johnson hits the weights six times per week and eats massive amounts of food. He is also well known by the incredible intensity and focus in the gym. With the years of experience under his belt, he is a seasoned weightlifter who trains instinctively. When The Rock hits the gym, there is no talk and no time wasted – it’s a 100% hard work and dedication. – His favorite muscle group are the legs, which is why he trains them on Saturday when he has the most time. The workout starts with a short 10 minute jog followed by shoulder rotations with light (5lb) dumbbells. Each exercise starts with a high reps (15 reps) set and the reps go down as the weight increases. Dwayne performs a drop set on the last set on nearly every exercise. The following workout is a typical shoulder workout that The Rock does and it usually take a bit more than one hour for him to complete it. Even though this looks like a bit too much work for natural trainees, and we recommend a lower volume shoulder routine , who can argue about Rock’s results ?